Nuclear power reactors are a system which requires 100 percent perfect safety all the time. Of course, enter in error-prone humans and profit-motive CEO's and this becomes an impossible achievement. Take just the Chernobyl accident alone. Fallout covered much of eastern Europe, the United Kingdom and all the way over to the Eastern United States. The ground immediately downwind of the meltdown explosion is now uninhabitable for 600 years. Here are the serious accidents and incidents known in the public domain. It is quite possible many more occurred that went unreported (for instance, Romanian officials claimed they had near-meltdown events, but that their modularized containment tubes design made it impossible to harm anybody.) In another critical industry, Aviation is a super safe system which requires great documentation, however, airlines have repeatedly been caught not performing required safety work or in actual collusion with government inspectors. When an airliner goes down a hundred people may be killed. When a nuclear reactor leaks or explodes, millions can suffer adverse health affects. After you see how many close calls we've had, and how many thousands of places are now contaminated due to reactor operation (including depleted uranium ammunition) it seems impossible that an informed public would ever support such a dangerous menace in their back yards. This article lists notable civilian accidents involving fissile nuclear material or nuclear reactors. Civilian incidents not serious enough to be accidents are listed at List of civilian nuclear incidents. To qualify as "civilian", the nuclear operation/material must be principally for non-military purposes. The event should involve fissile material or a reactor. A reactor shutoff rod failure, combined with several operator errors, led to a major power excursion of more than double the reactor's rated output at AECL's NRX reactor. The operators purged the reactor's heavy water moderator, and the reaction stopped in under 30 seconds. 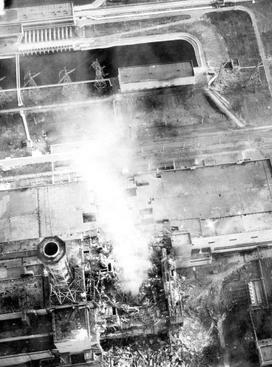 A cover gas system failure led to hydrogen explosions, which severely damaged the reactor core. The fission products from approximately 30 kg of uranium were released through the reactor stack. Irradiated light-water coolant leaked from the damaged coolant circuit into the reactor building; some 4,000 cubic meters were pumped via pipeline to a disposal area to avoid contamination of the Ottawa River. Subsequent monitoring of surrounding water sources revealed no contamination. No immediate fatalities or injuries resulted from the incident; a 1982 followup study of exposed workers showed no long-term health effects. Future U.S. President Jimmy Carter, then a nuclear engineer in the US Navy, was among the cleanup crew. Due to inadequate cooling a damaged uranium fuel rod caught fire and was torn in two as it was being removed from the core at the NRU reactor. The fire was extinguished, but not before radioactive combustion products contaminated the interior of the reactor building and to a lesser degree, an area surrounding the laboratory site. Over 600 people were employed in the clean-up. The Soviet icebreaker Lenin, the USSR’s first nuclear-powered surface ship, suffered a major accident (possibly a meltdown — exactly what happened remains a matter of controversy in the West) in one of its three reactors. To find the leak the crew broke through the concrete and steel radiation shield with sledgehammers, causing irreparable damage. It was rumored that around 30 of the crew were killed. The ship was abandoned for a year to allow radiation levels to drop before the three reactors were removed, to be dumped into the Tsivolko Fjord on the Kara Sea, along with 60% of the fuel elements packed in a separate container. The reactors were replaced with two new ones, and the ship re-entered service in 1970, serving until 1989. Graphite debris partially blocked a fuel channel causing a fuel element to melt and catch fire at the Chapelcross nuclear power station. Contamination was confined to the reactor core. The core was repaired and restarted in 1969, operating until the plant's shutdown in 2004. .
A mishandled reactor safety test led to an uncontrolled power excursion, causing a severe steam explosion, meltdown and release of radioactive material at the Chernobyl nuclear power plant located approximately 100 kilometers north-northwest of Kiev. Approximately fifty fatalities resulted from the accident and the immediate aftermath most of these being cleanup personnel. An additional nine fatal cases of thyroid cancer in children in the Chernobyl area have been attributed to the accident. The explosion and combustion of the graphite reactor core spread radioactive material over much of Europe. 100,000 people were evacuated from the areas immediately surrounding Chernobyl in addition to 300,000 from the areas of heavy fallout in Ukraine, Belarus and Russia. An "Exclusion Zone" was created surrounding the site encompassing approximately 1,000 mi² (3,000 km²) and deemed off-limits for human habitation for an indefinite period. Several studies by governments, UN agencies and environmental groups have estimated the consequences and eventual number of casualties. Their findings are subject to controversy. Twenty metric tons of uranium and 160 kilograms of plutonium dissolved in 83,000 litres of nitric acid leaked over several months from a cracked pipe into a stainless steel sump chamber at the Thorp nuclear fuel reprocessing plant. The partially processed spent fuel was drained into holding tanks outside the plant. .
On 20 March 1978 a failure of power supply for the plant's non-nuclear instrumentation system led to steam generator dryout. (ref NRC LER 312/78-001). In an on-going study (ref NRC Commission Document SECY-05-0192 Attachment 2 ) of "precursors" that could lead to a nuclear disaster if additional failures were to have occurred, the NRC concluded (as of 24-Oct-2005) that this event at Rancho Seco was the third highest ranked occurrence (second highest if one omits the event at the Three Mile Island Nuclear Generating Station). When the reactor was at power, a failure of the NNI power supply resulted in a loss of main feedwater, which caused a reactor trip. Because instrumentation drift falsely indicated that the steam generator contained enough water, control room operators did not take prompt action to open the EFW flow control valves to establish secondary heat removal. This resulted in steam generator dryout. This is a list of civilian nuclear incidents which are notable, but do not fit the criteria for inclusion in List of civilian nuclear accidents. Military accidents are listed at List of military nuclear accidents. Civil radiation accidents not involving fissile material are listed at List of civilian radiation accidents. For a general discussion of both civilian and military accidents, see Nuclear and radiation accidents. The incident must be related directly to radioactive material, not merely (for example) at a nuclear power plant. An operator error caused overheating and melting of some fuel in the Experimental Breeder Reactor-1 facility at the National Reacor Testing Station in Idaho. There was no raditaion release or exposure. A fire caused by careless technicians cut off many control circuits for two nuclear power reactors of the Tennessee Valley Authority at Browns Ferry Station in Alabama. The fire burned uncontrolled for 7.5 hours and the two operating GE nuclear reactors were at full power when the fire began. One of them went "dangerously out of control" for several hours and was not stabilized until a few hours after the fire was put out. There was some concern about a meltdown, but this did not occur and there was no radioactive contamination. An electromatic relief valve stuck open following a reactor scram at the Davis-Besse nuclear power plant near Toldedo, OH. The valve was noticed by operators, and the reactor, manufactured by Babcock & Wilcox, was only slightly damaged. Two workers were exposed to a small amount of radiation and suffered minor burns when a fire broke out at the Onagawa Nuclear Power Station Miyagi Prefecture, Japan. The fire occurred in the basement of reactor #3 during a routine inspection when a spray can was punctured accidentally, igniting a sheet of plastic. UK Authorities blamed an incident at a Scottish nuclear plant on "procedural and hardware deficiencies". Fuel rods falling to the floor were deemed responsible for the incident. An incident occurred in a building housing turbines for the Mihama 3 reactor. Hot water and steam leaking from a broken pipe killed five workers and resulted in six others being injured. Officials insist that there was no radiation leak, and there is no danger to the surrounding area. In September, the site's cementation plant was closed when 266 litres of radioactive reprocessing residues were spilled inside containment. In October, another of the site's reprocessing laboratories was closed down after nose-blow tests of eight workers tested positive for trace radioactivity. An electrical fault prompted shut down of the Forsmark Nuclear Power Plant, Sweden. Although there was no damage to the reactor, no radioactive release and no adverse health consequences, the incident highlighted potentially hazardous flaws in the site's reactor shutdown procedures, as well as two out of four German-built Siemens emergency coolant pumps failing. Hunterston B nuclear power station in the UK had to be shut down due to "problems with controls that keep the delicate process at exactly the right temperature". A 6.8 magnitude earthquake struck the Kashiwazaki-Kariwa nuclear plant. A small fire in a transformer was extinguished a few hours later. Several reactors were automatically closed down and as of April 2009 they have not been restarted. The quake was stronger than the reactors had been designed to withstand. Ascó Nuclear Power Plant told the Spanish Nuclear Board that about 200 thousand Bq were leaked to the atmosphere, due to a configuration failure in the ventilation systems. The incident was declared at INES level 1. However, the Spanish Nuclear Board realized there were leaked more than 80 millions Bq, and the incident was notified in April 2008. So the incident was updated to INES Level 2, the Nuclear Power Plant was fined with 15 millions euros and it manager removed. Emergency response system ECURIE (European Community Urgent Radiological Information Exchange) received an alert message following a loss of coolant accident at the Krsko Nuclear Power Plant. A 6.25 m³ material leak is discovered on the Tricastin Nuclear Power Center, with 12g of uranium per litre (around 75kg in total). The Préfecture forbid the use of water, bath, nautical activities, fishing and irrigation in the Bollène area. During a maintenance on the 4th reactor of the Tricastin Nuclear Power Center, a pipe was opened and low level radiation contaminated around 100 employees. ^ "Three Mile Island (The Hour-By-Hour Account of What Really Happened)", by Mark Stephens, First Edition, page 75. ^ Vivian Weil, (1983). "The Browns Ferry Case" in Engineering Professionalism and Ethics, edited by James H. Schaub and Karl Pavlovic, and published by John Wiley & Sons. ^ "Three Mile Island (The Hour-By-Hour Account of What Really Happened)", by Mark Stephens, First Edition, page 76. ^ UNEP Year Book 2009 p. 18. ^ Will French Leaks Harm Nuclear's Revival? To qualify as “military”, the nuclear operation/material must be principally for military purposes. Shortly after the Leipzig L-IV atomic pile — worked on by Werner Heisenberg and Robert Doepel — demonstrated Germany’s first signs of neutron propagation, the device was checked for a possible heavy water leak. During the inspection air leaked in igniting the uranium powder inside. The burning uranium boiled the water jacket, generating enough steam pressure to blow the reactor apart. Burning uranium powder scattered throughout the lab causing a larger fire at the facility. A sketch of Louis Slotin’s criticality accident used to determine exposure of those in the room at the time. Harry K. Daghlian, Jr. dropped a tungsten carbide brick onto a plutonium core, inadvertently creating a critical mass at the Los Alamos Omega site. He quickly removed the brick, but was fatally irradiated, dying September 15. While demonstrating his technique to visiting scientists at Los Alamos, Canadian physicist Louis Slotin manually assembled a critical mass of plutonium. A momentary slip of a screwdriver caused a prompt critical reaction. Slotin died on May 30 from massive radiation poisoning, with an estimated dose of 1,000 rads (rad), or 10 grays (Gy). Seven observers, who received doses as high as 166 rads, survived. Both men, Daghlian and Slotin, were working with the same bomb core which was known as the “demon core”. A USAF B-36 bomber, AF Ser. No. 44-92075, was flying a simulated combat mission from Eielson Air Force Base, near Fairbanks, Alaska, to Carswell Air Force Base in Fort Worth, Texas carrying one weapon containing a dummy warhead. The warhead contained uranium instead of plutonium. After six hours of flight, the bomber experienced mechanical problems and was forced to shut down three of its engines at an altitude of 12,000 feet (3,700 m). Fearing that severe weather and icing would jeopardize a safe emergency landing, the weapon was jettisoned over the Pacific Ocean from a height of 8,000 ft (2,400 m). The weapon’s high explosives detonated upon impact. All of the sixteen crew members and one passenger were able to parachute from the plane and twelve were subsequently rescued from Princess Royal Island. The Pentagon’s summary report does not mention if the weapon was later recovered. Three minutes after departure from Kirtland Air Force Base in Albuquerque a USAF B-29 bomber carrying a nuclear weapon, four spare detonators, and a crew of thirteen crashed into a mountain near Manzano Base. The crash resulted in a fire which the New York Times reported as being visible from 15 miles (24 km) The bomb’s casing was completely demolished and its high explosives ignited upon contact with the plane’s burning fuel. However, according to the Department of Defense, the four spare detonators and all nuclear components were recovered. A nuclear detonation was not possible because, while on board, the weapon’s core was not in the weapon for safety reasons. All thirteen crew members died. USAF B-50 aircraft on a training mission from Biggs Air Force Base with a nuclear weapon flew into the ground. High explosive detonation, but no nuclear explosion. Returning one of several U.S. Mark 4 nuclear bombs secretly deployed in Canada, a USAF B-50 had engine trouble and jettisoned the weapon at 10,500 feet (3,200 m). The crew set the bomb to self-destruct at 2,500 ft (760 m) and dropped over the St. Lawrence River. The explosion shook area residents and scattered nearly 100 pounds (45 kg) of depleted uranium used in the weapon's tamper. The plutonium core (“pit”) was not in the bomb at the time. During the Castle Bravo test of the first deployable hydrogen bomb, a miscalculation resulted in the explosion being over twice as large as predicted, with a total explosive force of 15 megatons of TNT (63 PJ). Of the total yield, 10 Mt (42 PJ) were from fission of the natural uranium tamper, but those fission reactions were quite dirty, producing a large amount of fallout. Combined with the much-larger-than-expected yield and an unanticipated wind shift radioactive fallout was spread eastward onto the inhabited Rongelap and Rongerik Atolls. These islands were evacuated, but many of the Marshall Islands natives have since suffered from birth defects and have received some compensation from the federal government. A Japanese fishing boat, Daigo Fukuryu Maru, also came into contact with the fallout, which caused many of the crew to take ill with one fatality. The test resulted in an international uproar and reignited Japanese concerns about radiation, especially with regard to the possible contamination of fish. Operator error led to a partial core meltdown in the experimental EBR-I breeder reactor, resulting in temporarily elevated radioactivity levels in the reactor building and necessitating a significant repair. A USAF B-47 Stratojet disappeared before a scheduled refueling, while carrying two nuclear weapon cores. The plane was lost while flying through dense clouds, and the cores and other wreckage were never located. A USAF C-124 aircraft from Dover Air Force Base, Delaware was carrying three nuclear bombs over the Atlantic Ocean when it experienced a loss of power. The crew jettisoned two nuclear bombs to protect their safety, which were never recovered. A fire began in a materials handling glove box and spread through the ventilation system into the stack filters at the Rocky Flats weapons mill 27 kilometres (17 mi) from Denver, Colorado. Plutonium and other contaminants were released, but the exact amount of which contaminants is unknown; estimates range from 25 mg to 250 kg. See Kyshtym disaster. A cooling system failure at the Mayak nuclear processing plant resulted in a major explosion and release of radioactive materials. Hundreds of people died and hundreds of thousands were evacuated. See Windscale fire. Technicians mistakenly overheated Windscale Pile No. 1 during an annealing process to release Wigner energy from graphite portions of the reactor. Poorly placed temperature sensors indicated the reactor was cooling rather than heating. The excess heat lead to the failure of a nuclear cartridge, which in turn allowed uranium and irradiated graphite to react with air. The resulting fire burned for days, damaging a significant portion of the reactor core. About 150 burning fuel cells could not be lifted from the core, but operators succeeded in creating a firebreak by removing nearby fuel cells. An effort to cool the graphite core with water eventually quenched the fire. The reactor had released radioactive gases into the surrounding countryside, primarily in the form of iodine-131 (131I). Milk distribution was banned in a 200-square-mile (520 km2) area around the reactor for several weeks. A 1987 report by the National Radiological Protection Board predicted the accident would cause as many as 33 long-term cancer deaths, although the Medical Research Council Committee concluded that “it is in the highest degree unlikely that any harm has been done to the health of anybody, whether a worker in the Windscale plant or a member of the general public.” The reactor that burned was one of two air-cooled graphite-moderated natural uranium reactors at the site used for production of plutonium. During a simulated takeoff a wheel casting failure caused the tail of a USAF B-47 carrying an armed nuclear weapon to hit the runway, rupturing a fuel tank and sparking a fire. Some contamination was detected immediately following the accident. See Tybee Bomb. A USAF B-47 bomber jettisoned a Mark 15 Mod 0 nuclear bomb over the Atlantic Ocean after a midair collision with a USAF F-86 Sabre during a simulated combat mission from Homestead Air Force Base, Florida. The F-86’s pilot ejected and parachuted to safety. The USAF claimed the B-47 tried landing at Hunter Air Force Base, Georgia three times before the bomb was jettisoned at 7,200 ft (2,200 m) near Tybee Island, Georgia. The B-47 pilot maintains he successfully landed in one attempt only after he first jettisoned the bomb. A 3-square-mile (7.8 km2) area near Wassaw Sound was searched for 9 weeks before the search was called off. The bomb was searched for in 2001 and not found. A new group in 2004 claims to have found an underwater object which it thinks is the bomb. A supercritical portion of highly enriched uranyl nitrate was allowed to collect in the drum causing a prompt neutron criticality in the C-1 wing of building 9212 at the Oak Ridge National Laboratory Y-12 complex. It is estimated that the reaction produced 1.3 * 1018 fissions. Eight employees were in close proximity to the drum during the accident, receiving neutron doses ranging from 30 to 477 rems. No fatalities were reported. During chemical purification a critical mass of a plutonium solution was accidentally assembled at Los Alamos National Laboratory. The crane operator died of acute radiation sickness. The March, 1961 Journal of Occupational Medicine printed a special supplement medically analyzing this accident. Hand-manipulations of critical assemblies were abandoned as a matter of policy in U.S. federal facilities after this accident. A leak developed in the steam generators and in a pipe leading to the compensator reception on the ill-fated K-8 while the Soviet Northern Fleet November-class submarine was on exercise. While the crew rigged an improvised cooling system, radioactive gases leaked into the vessel and three of the crew suffered visible radiation injuries according to radiological experts in Moscow. Some crew members had been exposed to doses of up to 1.8 - 2 Sv (180 - 200 rem). During maintenance procedures the SL-1 experimental nuclear reactor underwent a prompt critical reaction causing the water surrounding the core to explosively vaporize. A pressure wave struck the top of the reactor vessel propelling the control rods and entire reactor vessel upwards. One operator who had been standing on top of the vessel was killed when flying control rods pinned him to the ceiling. Two other military personnel supervising the maintenance operations were also killed. See SL-1. A USAF B-52 bomber caught fire and exploded in midair due to a major leak in a wing fuel cell 12 miles (19 km) north of Seymour Johnson Air Force Base, North Carolina. Five crewmen parachuted to safety, but three died—two in the aircraft and one on landing. The incident released the bomber’s two Mark 39 hydrogen bombs. Three of the four arming devices on one of the bombs activated, causing it to carry out many of the steps needed to arm itself, such as the charging of the firing capacitors and, critically, the deployment of a 100-foot (30 m) diameter retardation parachute. The parachute allowed the bomb to hit the ground with little damage. The fourth arming device — the pilot’s safe/arm switch — was not activated preventing detonation. The second bomb plunged into a muddy field at around 700 mph (300 m/s) and disintegrated. Its tail was discovered about 20 feet (6 m) down and much of the bomb recovered, including the tritium bottle and the plutonium. However, excavation was abandoned due to uncontrollable ground water flooding. Most of the thermonuclear stage, containing uranium, was left in situ. It is estimated to lie around 180 feet (55 m) below ground. The Air Force purchased the land and fenced it off to prevent its disturbance, and it is tested regularly for contamination, although none has so far been found. USAF B-52 bomber experienced a decompression event that required it to fly below 10,000 feet. Resulting increased fuel consumption led to fuel exhaustion; the aircraft crashed with two nuclear bombs, which did not trigger a nuclear explosion. The Soviet Hotel-class submarine K-19 suffered a failure in its cooling system. Reactor core temperatures reached 800 °C (1,000 °F), nearly enough to melt the fuel rods, although the crew was able to regain temperature control by using emergency procedures. The incident contaminated parts of the ship, some of the onboard ballistic missiles and the crew, resulting in several fatalities. The movie K-19: The Widowmaker, starring Harrison Ford and Liam Neeson, offers a controversially fictionalized story of these events. The second French underground nuclear test, codenamed Béryl, took place in a shaft under mount Taourirt, near In Ecker, 150 km (100 mi) north of Tamanrasset, Algerian Sahara. Due to improper sealing of the shaft, a spectacular flame burst through the concrete cap and radioactive gases and dust were vented into the atmosphere. The plume climbed up to 2600m (8500 ft) high and radiation was detected hundreds of km away. About a hundred soldiers and officials, including two ministers, were irradiated. The number of contaminated Algerians is unknown. A USAF B-52 on airborne alert duty encountered a severe winter storm and extreme turbulence, ultimately disintegrating in mid-air over South Central Pennsylvania. Only the two pilots survived. One crew member failed to bail out and the rest succumbed to injuries or exposure to the harsh winter weather. A search for the missing weapons was initiated, and recovery was effected from portions of the wreckage at a farm northwest of Frostburg, MD. A U.S. Transit-5BN-3 nuclear-powered navigational satellite failed to reach orbital velocity and began falling back down at 150,000 feet (46 km) above the Indian Ocean. The satellite’s SNAP-9a generator contained 16 kCi (590 TBq) of 238Pu (2.1 pounds), which at least partially burned upon reentry. Increased levels of 238Pu were first documented in the stratosphere four months later. In the estimation of the EPA, there was little 238Pu contamination to human lungs (0.06 mrem or 0.6 µSv) compared to fallout from weapons tests in the 1950s (0.35 mrem or 3.5 µSv) or the EPA’s Clean Air Act airborne exposure limit of 10 mrem (100 µSv). All subsequent Transit satellites were fitted with solar panels. A USAF B-52 carrying four hydrogen bombs collided with a USAF KC-135 jet tanker during over-ocean in-flight refueling. Four of the B-52's seven crew members parachuted to safety while the remaining three were killed along with all four of the KC-135’s crew. The conventional explosives in two of the bombs detonated upon impact with the ground, dispersing plutonium over nearby farms. A third bomb landed intact near Palomares while the fourth fell 12 miles (19 km) off the coast into the Mediterranean sea. The US Navy conducted a three month search involving 12,000 men and successfully recovered the fourth bomb. The U.S. Navy employed the use of the deep-diving research submarine DSV Alvin to aid in the recovery efforts. During the ensuing cleanup, 1,500 tonnes (1,700 short tons) of radioactive soil and tomato plants were shipped to a nuclear dump in Aiken, South Carolina. The U.S. settled claims by 522 Palomares residents for $600,000. The town also received a $200,000 desalinization plant. The motion picture Men of Honor (2000), starring Cuba Gooding, Jr. as USN Diver Carl Brashear, and Robert De Niro as USN Diver Billy Sunday, contained an account of the fourth bomb’s recovery. A fire broke out in the navigator’s compartment of a USAF B-52 near Thule Air Base, Greenland. The bomber crashed 7 miles (11 km) from the air base, rupturing its nuclear payload of four hydrogen bombs. The recovery and decontamination effort was complicated by Greenland's harsh weather. Contaminated ice and debris were buried in the United States. Bomb fragments were recycled by Pantex, in Amarillo, Texas. The incident caused outrage and protests in Denmark, as Greenland is a Danish possession and Denmark forbade nuclear weapons on its territory. Information declassified in 2008 confirms that one of the bombs remains unaccounted for. During sea trials the Soviet nuclear submarine K-27 (Project 645) suffered severe problems with its reactor cooling systems. After spending some time at reduced power, reactor output inexplicably dropped and sensors detected an increase of gamma radiation in the reactor compartment to 150 rad/h. The safety buffer tank released radioactive gases further contaminating the submarine. The crew shut the reactor down and subsequent investigation found that approximately 20% of the fuel assemblies were damaged. The entire submarine was scuttled in the Kara Sea in 1981. While in the naval yards at Severodvinsk for repairs Soviet Yankee-class nuclear submarine K-140 suffered an uncontrolled increase of the reactor’s power output. One of the reactors activated automatically when workers raised control rods to a higher position and power increased to 18 times normal, while pressure and temperature levels in the reactor increased to four times normal. The accident also increased radiation levels aboard the vessel. The problem was traced to the incorrect installation of control rod electrical cables. The Soviet November-class attack submarine K-8 sank with all 52 crew members after suffering fires in two compartments simultaneously. Both reactors were shut down. The crew attempted to hook a tow line to an Eastern Bloc merchant vessel, but failed. In Area 8 on Yucca Flat, the 10 kiloton "Baneberry" weapons test of Operation Emery detonated as planned at the bottom of a sealed vertical shaft 900 feet below the Earth's surface but the device's energy cracked the soil in unexpected ways, causing a fissure near ground zero and the failure of the shaft stemming and cap. A plume of hot gases and radioactive dust was released three and a half minutes after ignition, and continuing for many hours, raining fallout on workers within NTS. Six percent of the explosion's radioactive products were vented. The plume released 6.7 MCi of radioactive material, including 80 kCi of Iodine-131 and a high ratio of noble gases. After dropping a portion of its load in the area, the hot cloud's lighter particles were carried to three altitudes and conveyed by winter storms and the jet stream to be deposited heavily as radionuclide-laden snow in Lassen and Sierra counties in northeast California, and to lesser degrees in northern Nevada, southern Idaho and some eastern sections of Oregon and Washington states. The three diverging jet stream layers conducted radionuclides across the US to Canada, the Gulf of Mexico and the Atlantic Ocean. An explosion at the Hanford site Plutonium Finishing Plant blew out a quarter-inch-thick lead glass window. Harold McCluskey, a worker, was showered with nitric acid and radioactive glass. He inhaled the largest dose of 241Am ever recorded, about 500 times the U.S. government occupational standards. The worker was placed in isolation for five months and given an experimental drug to flush the isotope from his body. By 1977, his body’s radiation count had fallen by about 80 percent. He died of natural causes in 1987 at age 75. Cosmos 954, a Soviet Radar Ocean Reconnaissance Satellite with an onboard nuclear reactor, failed to separate from its booster and broke up on reentry over Canada. The fuel was spread over a wide area and some radioactive pieces were recovered. The Soviet Union eventually paid the Canadian Government $3 million CAD for expenses relating to the crash. September 18, 1980 – At about 6:30 p.m., an airman conducting maintenance on a USAF Titan-II missile at Little Rock Air Force Base's Launch Complex 374-7 in Southside (Van Buren County), just north of Damascus, Arkansas, dropped a Socket wrench, which fell about eighty feet before hitting and piercing the skin on the rocket’s first-stage fuel tank, causing it to leak. At about 3:00 a.m., on September 19, 1980, the missile exploded. The W53 warhead landed about 100 feet (30 m) from the launch complex’s entry gate; its safety features operated correctly and prevented any loss of radioactive material. An Air Force airman was killed and the launch complex was destroyed. August 8, 1982 – While on duty in the Barents Sea, there was a release of liquid metal coolant from the reactor of the Soviet Project 705 Alfa-class submarine K-123. The accident was caused by a leak in the steam generator. Approximately two tons of metal alloy leaked into the reactor compartment, irreparably damaging the reactor such that it had to be replaced. It took nine years to repair the submarine. January 3, 1983 – The Soviet nuclear-powered spy satellite Kosmos 1402 burns up over the South Atlantic. August 10, 1985 – About 35 miles (56 km) from Vladivostok in Chazhma Bay, Soviet submarine K-431, a Soviet Echo-class submarine had a reactor explosion, producing fatally high levels of radiation. Ten men were killed, but the deadly cloud of radioactivity did not reach Vladivostok. 1986 – The U.S. government declassifies 19,000 pages of documents indicating that between 1946 and 1986, the Hanford Site in Richland, Washington, released thousands of US gallons (several m³) of radioactive liquids. Of 270,000 people living in the affected area, most received low doses of radiation from 131I. October 3, 1986 – 480 miles (770 km) east of Bermuda, K-219, a Soviet Yankee I-class submarine experienced an explosion in one of its nuclear missile tubes and at least three crew members were killed. Sixteen nuclear missiles and two reactors were on board. Soviet leader Mikhail Gorbachyov privately communicated news of the disaster to U.S. President Ronald Reagan before publicly acknowledging the incident on October 4. Two days later, on October 6, the submarine sank in the Atlantic Ocean while under tow in 18,000 feet (5,500 m) of water. October 1988 – At the nuclear trigger assembly facility at Rocky Flats in Colorado, two employees and a D.O.E. inspector inhale radioactive particles, causing closure of the plant. Several safety violations were cited, including uncalibrated monitors, inadequate fire equipment, and groundwater contaminated with radioactivity. 1997 – Georgian soldiers suffer radiation poisoning and burns. They are eventually traced back to training sources abandoned, forgotten, and unlabeled after the collapse of the Soviet Union. One was a 137Cs pellet in a pocket of a shared jacket which put out about 130,000 times the level of background radiation at 1 meter distance. February 2003: Oak Ridge, Tennessee Y-12 facility. During the final testing of a new saltless uranium processing method, there was a small explosion followed by a fire. The explosion occurred in an unvented vessel containing unreacted calcium, water and depleted uranium. An exothermic reaction among these articles generated enough steam to burst the container. This small explosion breached its glovebox, allowing air to enter and ignite some loose uranium powder. Three employees were contaminated. BWXT, a partnership of BWX Technologies and Bechtel National, was fined $82,500 for the accident. ^ Irving DJC (1967 (electronic: 2002)). The Virus House. Focal Point (Parforce UK Ltd.). ^ U.S. National Atomic Museum (1995-06-01). "Trinity Atomic Bomb". Retrieved 2007-06-17. ^ a b Tiwari J, Gray CJ. "U.S. Nuclear Weapons Accidents". Retrieved 2007-06-17. ^ a b c HR Lease (March 1986). "DoD Mishaps". Armed Forces Radiobiology Research Institute. Retrieved 2008-12-04. ^ Norris RS, Arkin WM, Burr W (1999). "Where they were". Bulletin of the Atomic Scientists 55 (6): 26–35. doi:10.2968/055006011. ^ Rohrig ND (2004-09-09). "Dose Reconstruction Project for NIOSH". Retrieved 2007-06-17. ^ "Industrial/Warnings of Serious Risks for Nuclear Reactor Operations". Retrieved 2007-06-17. ^ "1957 Fire". Citizen Summary: Rocky Flats Historical Public Exposures Studies. Retrieved 2007-06-17. ^ Rood AS, Grogan HA. "Estimated Exposure and Lifetime Cancer Incidence Risk from Plutonium Released from the 1957 Fire at the Rocky Flats Plant". RAC Report No. 2-CDPHE-RFP-1999-FINAL. Retrieved 2007-06-17. ^ Wasserman H, Solomon N. Bomb Production at Rocky Flats: Death Downwind. In: Killing Our Own: The Disaster of America's Experience with Atomic Radiation. Delta. ISBN 0-440-54566-6. Retrieved 2007-06-17. ^ "Ural Mountains Nuclear Waste". Retrieved 2007-06-17. ^ a b "Narrative Summary of Accidents Involving U.S. Nuclear Weapons 1950-1980". United States Department of Defence. April 1981. Retrieved 2009-04-23. ^ "U.S. Department of Defense Nuclear Weapons Accident 1950-1980: Introduction". The Defense Monitor. 1981. ISSN 0195-6450. Retrieved 2007-06-17. ^ CNN (2004-09-13). "Lost nuclear bomb possibly found: Device dropped in ocean off Georgia during Cold War". CNN.com. Retrieved 2007-06-17. ^ "K-8 submarine reactor accident, 1960". Database of radiological incidents and related events—Johnston's Archive. 2004-06-10. Retrieved 2007-06-17. ^ Grossman K (1997). "The Wrong Stuff: Plutonium in Space - Racism and Corporate Interests" ([dead link] – Scholar search). Earth Island Journal 12 (4). ^ CNN (1998). "Cold War: Broken Arrows (1960e)". CNN.com. Retrieved 2007-06-17. ^ Snider, Laura (2009-05-10). "Looking back on Mother's Day fire at Rocky Flats". Boulder & County News. Boulder Daily Camera. Retrieved 2009-07-26. "On Mother's Day in 1969… the worst industrial conflagration the country had ever seen… when Building 776-777 on the Rocky Flats campus eight miles south of Boulder caught fire…"
^ Greenlee, Robert (2008-04-24). "Flats Colorado.pdf Rocky Flats Colorado Nuclear Weapons Production Facility 1952 - 1988" (PDF). ME 360L - Mechanical Engineering Design III. University of New Mexico. Retrieved 2009-07-26. "1969 Fire … * Most costly industrial accident in US * 2 years to cleanup"
^ Moore, LeRoy (2006-January). "Guilt or innocence at Rocky Flats" (PDF). NUCLEAR NEXUS » Local Hazards » Rocky Flats. Rocky Mountain Peace and Justice Center. Retrieved 2009-07-26. "A fire at Rocky Flats on Mother’s Day, May 11, 1969, turned out to be the worst industrial fire to date in US history." ^ CNN (1998). "Cold War: Broken Arrows (1970a)". CNN.com. Retrieved 2007-06-17. ^ AP wire (2005-06-03). "Hanford nuclear workers enter site of worst contamination accident". Retrieved 2007-06-17. ^ CNN (1998). "Cold War: Broken Arrows (1970d)". CNN.com. Retrieved 2007-06-17. ^ CNN (1998). "Cold War: Broken Arrows (1980b)". CNN.com. Retrieved 2007-06-17. ^ CNN (1998). "Cold War: Broken Arrows (1980c)". CNN.com. Retrieved 2007-06-17. ^ Lluma, Diego (May/June 2000). "Former Soviet Union: What the Russians left behind". Bulletin of the Atomic Scientists 56 (3): 14–17. doi:10.2968/056003005. Bellona's listing of accidents of Soviet / Russian submarines, a fair number of which are nuclear powered. Currently not many are included in the list above. Nuclear powered submarines have suffered a number of accidents (not all related to the power supply). K-19, 1961, the reactor almost had a meltdown and exploded. Several of the crew died of radiation exposure. The events on board the submarine are dramatized by the film K-19: The Widowmaker. USS Thresher (SSN-593), 1963, was lost during deep diving tests and later investigation concluded that failure of a brazed pipe joint and ice formation in the ballast blow valves prevented surfacing. The accident motivated a number of safety changes to the US fleet. USS Scorpion (SSN-589), 1968, lost. K-27, 1968, experienced a near meltdown of one of its liquid metal (lead-bismuth) cooled VT-1 reactors, causing the ship to be deactivated by 20 July 1968. K-219, 1986, the reactor almost had a meltdown. Sergei Preminin died after he manually lowered the control rods, and stopped the explosion. The submarine sank three days later. K-141 Kursk, 2000, the generally accepted theory is that a leak of hydrogen peroxide in the forward torpedo room led to the detonation of a torpedo warhead, which in turn triggered the explosion of half a dozen other warheads about two minutes later. USS San Francisco (SSN-711), 2005, collided with a seamount in the Pacific Ocean. HMS Vanguard & Le Triomphant, February 2009, the French and British submarines collided in the Atlantic while on routine patrols. There were no injuries among the crews, but both ships were damaged during the collision. The chair of the Campaign for Nuclear Disarmament, Kate Hudson, said "the dents reportedly visible on the British sub show the boats were no more than a couple of seconds away from total catastrophe." Nuclear tests can involve many hazards. A number of these were illustrated in the U.S. Castle Bravo test in 1954. The weapon design tested was a new form of hydrogen bomb, and the scientists underestimated how vigorously some of the weapon materials would react. As a result, the explosion – with a yield of 15 Mt – was over twice what was predicted. Aside from this problem, the weapon also generated a large amount of radioactive nuclear fallout, more than had been anticipated, and a change in the weather pattern caused the fallout to be spread in a direction which had not been cleared in advance. The fallout plume spread high levels of radiation for over a hundred miles, contaminating a number of populated islands in nearby atoll formations (though they were soon evacuated, many of the islands' inhabitants suffered from radiation burns and later from other effects such as increased cancer rate and birth defects), as well as a Japanese fishing boat (Daigo Fukuryū Maru). One member of the boat's crew died from radiation sickness after returning to port, and it was feared that the radioactive fish they had been carrying had made it into the Japanese food supply. Castle Bravo was the worst U.S. nuclear accident, but many of its component problems – unpredictably large yields, changing weather patterns, unexpected fallout contamination of populations and the food supply – occurred during other atmospheric nuclear weapons tests by other countries as well. Concerns over worldwide fallout rates eventually led to the Partial Test Ban Treaty in 1963, which limited signatories to underground testing. Not all atmospheric tests stopped, however, but because the United States and the Soviet Union in particular stopped testing above ground it cut the number of atmospheric tests down substantially, because about 86% of all nuclear tests were conducted by those two countries. France continued atmospheric testing until 1974, and People's Republic of China until 1980. Radioactive fallout was spread eastward onto the inhabited Rongelap and Rongerik atolls which were tardily evacuated . Subsequently many Marshall Islands natives have suffered from birth defects and have received some compensation from the U.S. Federal government. A medical study, named Project 4.1, studied the effects of the fallout on the blast. A Japanese fishing boat, Lucky Dragon No. 5, came in direct contact with the fallout which caused many of the crew to grow ill; one eventually died. This resulted in an international uproar and reignited Japanese concerns about radiation, especially in regard that Japanese citizens were once more affected by U.S. nuclear weapons. The official U.S. line had been that the growth in the strength of atomic bombs was not accompanied by an equivalent growth in radiation released. Japanese scientists who had collected data from the fishing vessel disagreed with this. Sir Joseph Rotblat, working at St Bartholomew's Hospital, London, demonstrated that the contamination caused by the fallout from the test was far greater than that stated officially. Rotblat was able to deduce that the bomb had three stages and showed that the fission phase at the end of the explosion increased the amount of radioactivity a thousandfold. Rotblat's paper was taken up by the media, and the outcry in Japan reached such a level that diplomatic relations became strained and the incident was even dubbed by some as "a second Hiroshima". Nevertheless, the Japanese and U.S. governments quickly reached a political settlement which gave the fishery a compensation of 2 million dollars with the surviving victims receiving about ¥ 2 million each (US$ 5,550 in 1954, US$ 44000.12 in 2009). It was also agreed that the victims would not be given Hibakusha status. Unanticipated fallout and radiation also affected many of the vessels and personnel involved in the test, in some cases trapping them in bunkers. One prominent scientist later recalled that he was on a ship 30 miles (48 km) away, and received 10 Röntgen of radiation as a result. Sixteen crew members of the aircraft carrier USS Bairoko received beta burns and there was an increased cancer rate. Radioactive contamination also affected many of the testing facilities built on other islands of the Bikini atoll system. The fallout spread traces of radioactive material as far as Australia, India and Japan, and even the US and parts of Europe. Though organized as a secret test, Castle Bravo quickly became an international incident, prompting calls for a ban on the atmospheric testing of thermonuclear devices. Braidwood, IL (2005) - ? Erwin, TN (2006) - ? The Kyshtym disaster was a radiation contamination disaster, which happened on 29 September 1957, in Mayak, a nuclear fuel reprocessing plant in Russia (then a part of the Soviet Union). It measured as a Level 6 disaster on the International Nuclear Event Scale (the Chernobyl disaster is the only accident listed as more serious than this one). The event occurred in the town of Ozyorsk, a closed city in the USSR built around Mayak. Since Ozyorsk/Mayak (also known as Chelyabinsk-40 and Chelyabinsk-65) were not marked on maps, the disaster was named for Kyshtym, the nearest known town. After the Second World War the Soviet Union lagged behind the United States in development of nuclear weapons, so it started a rapid research and development program to produce a sufficient amount of weapons-grade uranium and plutonium. The Mayak plant was built in a great hurry between 1946 and 1950. Gaps in knowledge of Soviet physicists about nuclear physics at the time made it difficult to judge the safety of many decisions. Also, environmental concerns were not taken seriously during the early development stage. Initially Mayak was dumping high-level radioactive waste into a nearby river, which was taking waste to the river Ob, flowing farther down to the Arctic Ocean. Later on, Lake Karachay was used for open-air storage. A storage facility for liquid nuclear waste was added around 1953. It consisted of steel tanks mounted in a concrete base, 8.2 meters underground. Because of the high level of radioactivity, the waste was heating itself (though a chain reaction was not possible). For that reason, a cooler was built around each bank containing 20 tanks. Facilities for monitoring operation of the coolers and the content of the tanks were not adequate. In September 1957 the cooling system in one of the banks containing about 70-80 tons of radioactive waste failed, and the temperature in it started to rise, resulting in a non-nuclear explosion of the dried waste having a force estimated at about 70-100 tons of TNT, which threw the concrete lid, weighing 160 tons, into the air. There were no immediate casualties as a result of the explosion, which released some 740 PBq (20 MCi) of radioactivity.. In the next 10 to 11 hours the radioactive cloud moved towards the northeast, reaching 300-350 kilometers from the accident. The fallout of the cloud resulted in a long-term contamination of an area of more than 800 square kilometers, primarily with caesium-137 and strontium-90. This area is usually referred to as the East-Ural Radioactive Trace (EURT). Because of the secrecy surrounding Mayak, the population of affected areas were not initially informed of the accident. A week later (on 6 October) an operation for evacuating 10,000 people from the affected area started, still without giving an explanation of the reasons for evacuation. People "grew hysterical with fear with the incidence of unknown 'mysterious' diseases breaking out. Victims were seen with skin 'sloughing off' their faces, hands and other exposed parts of their bodies." It was Zhores Medvedev who revealed the nature and extent of the disaster to the world. Even though the Soviet government suppressed information about the figures, it is estimated that the direct exposure to radiation caused at least 200 cases of death from cancer. To reduce the spread of radioactive contamination after the accident, contaminated soil was excavated and stockpiled in fenced enclosures that were called "graveyards of the earth". Rumours of a nuclear mishap somewhere in the vicinity of Chelyabinsk had long been circulating in the West. That there had been a serious nuclear accident west of the Urals was eventually inferred from research on the effects of radioactivity on plants, animals, and ecosystems, published by Professor Leo Tumerman, former head of the Biophysics Laboratory at the Institute of Molecular Biology in Moscow, and associates. According to Gyorgy, who invoked the Freedom of Information Act to gain access to the relevant Central Intelligence Agency (CIA) files, the CIA knew of the 1957 Mayak accident all along, but kept it secret to prevent adverse consequences for the fledgling American nuclear industry. Only in 1990 did the Soviet government declassify documents pertaining to the disaster. The level of radiation in Ozyorsk itself is claimed to be safe for humans, but the area of EURT is still heavily contaminated with radioactivity. Mayak (Russian: Маяк, "beacon") is a nuclear fuel reprocessing plant between the towns of Kasli and Kyshtym (Кыштым also transliterated Kishtym or Kishtim) 72 km northwest of Chelyabinsk in Russia. The plant is in the Ozersk central administrative territorial unit, formerly known as Chelyabinsk-40, later as Chelyabinsk-65, and part of the Chelyabinsk Oblast. Working conditions at Mayak resulted in severe health hazards and many accidents, with a serious accident occurring in 1957. In the past 45 years, about half a million people in the region have been irradiated in one or more of the incidents, exposing some of them to more than 20 times the radiation suffered by the Chernobyl disaster victims. Mayak was the goal of Gary Powers' surveillance flight in May 1960. The Mayak plant was built in 1945-48, in a great hurry and in total secrecy, as part of the Soviet Union's nuclear weapon program. The plant's original mission was to make, refine, and machine plutonium for weapons. Five nuclear reactors were built for this purpose. Later the plant came to specialize in reprocessing plutonium from decommissioned weapons, and waste from nuclear reactors. Today the plant makes tritium and radioisotopes, but no plutonium. In recent years, proposals that the plant reprocess, for money, waste from foreign nuclear reactors have given rise to controversy. In the early years of its operation, the Mayak plant released quantities of radioactively contaminated water into several small lakes near the plant, and into the Techa river, whose waters ultimately flow into the Ob River. The downstream consequences of this radiation pollution have yet to be determined. Some residents of Ozersk claim that living there poses no present-day risk, because of the decrease in the ambient radiation level over the past 50 years. They also report no problems with their health and the health of Mayak plant workers. These claims lack hard verification, and no one denies that many who worked at the plant in 1950s and '60s subsequently died of the effects of radiation. While the situation has since improved, the administration of the Mayak plant has been repeatedly criticized in recent years for environmentally unsound practices. Working conditions at Mayak resulted in severe health hazards and many accidents. The most notable accident occurred on 29 September 1957, when the failure of the cooling system for a tank storing tens of thousands of tons of dissolved nuclear waste resulted in a non-nuclear explosion having a force estimated at about 75 tons of TNT (310 gigajoules), which released some 2 Million Curies of radioactivity over 15,000 sq. miles. Subsequently, at least 200 people died of radiation sickness, 10,000 people were evacuated from their homes, and 470,000 people were exposed to radiation. People "grew hysterical with fear with the incidence of unknown 'mysterious' diseases breaking out. Victims were seen with skin 'sloughing off' their faces, hands and other exposed parts of their bodies." "Hundreds of square miles were left barren and unusable for decades and maybe centuries. Hundreds of people died, thousands were injured and surrounding areas were evacuated." This nuclear accident, the Soviet Union's worst before the Chernobyl disaster, is categorised as a level 6 "serious accident" on the 0-7 International Nuclear Events Scale. On 10 December 1968, the facility was experimenting with plutonium purification techniques. Two operators were using an "unfavorable geometry vessel in an improvised and unapproved operation as a temporary vessel for storing plutonium organic solution." In other words, the operators were decanting plutonium solutions into the wrong type of vessel. After most of the solution had been poured out, there was a flash of light, and heat. After the complex had been evacuated, the shift supervisor and radiation control supervisor re-entered the building. The shift supervisor then deceived the radiation control supervisor and entered the room of the incident and possibly attempted to pour the solution down a floor drain, causing a large nuclear reaction and irradiating himself with a deadly dose of radiation. The shift supervisor's actions are the subject of a Darwin Award nomination. The Mayak plant is associated with two other major nuclear accidents. The first occurred as a result of heavy rains causing Lake Karachay polluted with radioactive waste to release radioactive material into surrounding waters, and the second occurred in 1967 when wind spread dust from the bottom of Lake Karachay, a dried-up radioactively polluted lake (used as a dumping basin for Mayak's radioactive waste since 1951), over parts of Ozersk; over 400,000 people were irradiated. What will happen when another accident happens? Authorities in Italy are investigating a 'Ndrangheta mafia clan accused of trafficking and illegally dumping nuclear waste. According to a turncoat, a manager of the Italy’s state energy research agency Enea paid the clan to get rid of 600 drums of toxic and radioactive waste from Italy, Switzerland, France, Germany, and the US, with Somalia as the destination, where the waste was buried after buying off local politicians. Former employees of Enea are suspected of paying the criminals to take waste off their hands in the 1980s and 1990s. Shipments to Somalia continued into the 1990s, while the 'Ndrangheta clan also blew up shiploads of waste, including radioactive hospital waste, and sending them to the sea bed off the Calabrian coast. According to the environmental group Legambiente, former members of the 'Ndrangheta have said that they were paid to sink ships with radioactive material for the last 20 years. A number of incidents have occurred when radioactive material was disposed of improperly, shielding during transport was defective, or when it was simply abandoned or even stolen from a waste store. In the Soviet Union, waste stored in Lake Karachay was blown over the area during a dust storm after the lake had partly dried out. At Maxey Flat, a low-level radioactive waste facility located in Kentucky, containment trenches covered with dirt, instead of steel or cement, collapsed under heavy rainfall into the trenches and filled with water. The water that invaded the trenches became radioactive and had to be disposed of at the Maxey Flat facility itself. In other cases of radioactive waste accidents, lakes or ponds with radioactive waste accidentally overflowed into the rivers during exceptional storms. In Italy, several radioactive waste deposits let material flow into river water, thus contaminating water fit for domestic use. In France, in the summer of 2008 numerous incidents happened; in one, at the Areva plant in Tricastin, it was reported that during a draining operation liquid containing untreated uranium overflowed out of a faulty tank and about 75 kg of the radioactive material seeped into the ground and, from there, into two rivers nearby;; in another case, over 100 staff were contaminated with low doses of radiation. The 'Ndrangheta, a criminal organisation from Calabria (Italy) has been involved in radioactive waste dumping since the 1980s. Ships with toxic and radioactive waste were sunk off the Italian coast. In addition, vessels were allegedly sent to Somalia and other developing countries with toxic waste, including radioactive waste cargoes, which were either sunk with the ship or buried on land. The introduction of more rigorous environmental legislation in the 1980s made illegal waste dumping a lucrative business for organised crime groups in Italy. A 1995 parliamentary waste commission report spoke of the "possible existence of national and international trafficking in radioactive waste, managed by business and criminal lobbies, which are believed to operate also with the approval of institutional subjects belonging to countries and governments of the European Union and outside the EU." Its conclusions noted "interferences and threats" against investigators, and were critical of Enea, Italy's state energy research agency, and their management of nuclear waste. The 'Ndrangheta, an Italian mafia syndicate, has been accused by turncoat Francesco Fonti, a former member of 'Ndrangheta, of sinking at least 30 ships loaded with toxic waste, much of it radioactive. In 2005, Fonti revealed the conspiracy in the news magazine L'espresso. His statements led to widespread investigations into the radioactive waste disposal rackets, involving Giorgio Comerio and his disposal company, the Odm (Oceanic Disposal Management). Legambiente, an Italian NGO for the protection of the environment provided the public prosecutor’s office with all the data collected by Legambiente since 1994 concerning the disappearance of at least 40 ships in Mediterranean waters. Over two decades Italian prosecutors have looked into more than 30 suspicious deep-water sinkings. They suspect that Italian and foreign industrialists have acted in league with the 'Ndrangheta, and possibly government agencies, to use the Mediterranean as a dumping ground. Vessels that sank in fair weather had suspicious cargo, sent no mayday or the crew vanished. According to Fonti a manager of Enea paid the clan to get rid of 600 drums of toxic and radioactive waste from Italy, Switzerland, France, Germany, and the US, with Somalia as the destination, where the waste was buried after buying off local politicians. Former employees of Enea are suspected of paying the criminals to take waste off their hands in the 1980s and 1990s. Shipments to Somalia continued into the 1990s, while the 'Ndrangheta clan also blew up shiploads of waste, including radioactive hospital waste, and sending them to the sea bed off the Calabrian coast. Fonti personally sank three ships and identified a wreck located 28 kilometres off the coast of Cetraro, in Calabria, by environmental workers as MV Cunsky and says he sunk it himself in 1992, complete with 120 barrels of toxic and radioactive waste. He said 'Ndrangheta received £100,000 for the job. Fonti had been put on the job by his boss Sebastiano Romeo of the 'Ndrangheta clan from San Luca in collaboration with Giuseppe Giorgi. Another 'Ndrangheta boss involved was Natale Iamonte who sank ships near Melito di Porto Salvo. Both Fonti and environmental group Legambiente claimed vessels were sent to Somalia and other developing countries such as Kenya and Zaire with toxic cargoes, which were either sunk with the ship or buried on land. Legambiente alleges that local rebel groups were given weapons in exchange for receiving the waste ships. Fonti claims that Italian TV journalist Ilaria Alpi and her cameraman Miran Hrovatin were murdered in 1994 in Somalia because they had seen toxic waste arrive in Bosaso, Somalia. The huge waves which battered northern Somalia after the 2004 Indian Ocean tsunami are believed to have stirred up illegally dumped nuclear and toxic waste. There is also lead, and heavy metals such as cadmium and mercury. The waves broke up rusting barrels and other containers and hazardous waste dumped along the long, remote shoreline in the war-racked country during the early 1990s, according to the United Nations Environment Programme (UNEP) said. According to Fonti Christian Democrat politicians, including former prime minister Ciriaco De Mita, had been involved in illegal disposal operations, using the secret service SISMI to cover up their connection. De Mita denied the allegations. Fonti also claimed that Socialist politicians Gianni De Michelis and Bettino Craxi intervened to ensure that Italian peacekeeping troops in Somalia turned a blind eye to the transports. Because of corrupt Human nature, nuclear power is unsafe under any circumstances.